What does it mean to make science more public, open or accountable? How is ‘the public’ imagined and constituted? 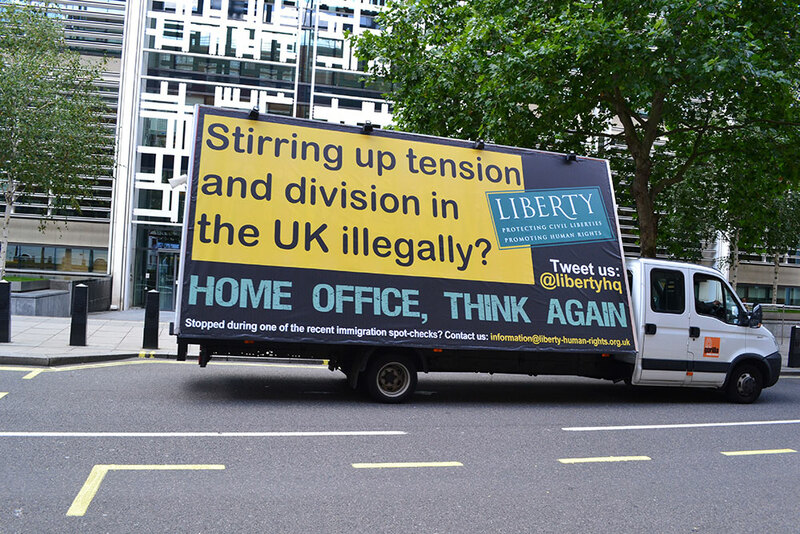 How does this relate to challenges of legitimacy and moderation in politics and policymaking? These questions have been explored by ‘Making Science Public’, a five-year research programme (2012-2017) funded by the Leverhulme Trust and based at the University of Nottingham in collaboration with the Universities of Sheffield and Warwick. The End of Award Conference on 22 June showcased findings from across the programme’s nine projects and two doctoral studentships, and considered implications for the future. While contemporary configurations of science, politics and publics show instances of promise, imagination, and experimentation, further work is needed to (re-)build institutions, conditions and capacities for public reason(ing) and political accountability. The day before the UK voted in the most controversial British referendum in recent times, the researchers of the Making Science Public programme gathered from across sociology, geography, politics, ethics, and STS, with an international, multidisciplinary audience, to reflect on the relationship between science, politics and publics in the UK and beyond. In introducing this theme, Sujatha Raman noted the unintentional significance of the conference’s timing, tagged ‘Britain’s “truthiness” moment’ by the press in acknowledgement of the prevalence of truth claims unencumbered by facts in the run-up to the referendum. The programme has focused on initiatives of open science, open policymaking, and engaged publics. So, have efforts towards making science public resulted in a greater capacity to engage with different forms of expertise? What are productive ways of holding together difference without falling apart? Raman borrowed the evocative metaphor of a sharp circle, attributed to the Archbishop of Canterbury, Justin Welby, to call attention to cultivating forms of reason that can accommodate contradictions. Now, in the post-referendum UK and broader European landscape, these questions are all the more relevant and charged. The day comprised four panel sessions, each with four speakers from the programme, comments from an external discussant and questions from the floor. It concluded with a lively public event. Have research agendas and policy practices been reframed as a result of initiatives to open them up? In Judith Tsouvalis’ case study of the UK outbreak of ash tree ‘dieback’ disease in 2012 onwards, a website for openly sharing genomic sequence data and a citizen science movement monitoring the spread of the disease did not equal ‘more democracy’. Rather, together with the British government-convened expert Task Force, they served to reproduce a culture of surveillance and control, omitting inconvenient publics (e.g. conservation organisations) that might challenge the predominant ‘biosecurity risk’ framing, and perpetuating post-political policymaking. Pru Hobson-West described the emergence of a ‘transparency’ imperative in the field of animal research, pushed by three discourse coalitions (animal protection groups; the animal research community; government/research funders), justified to counter, respectively, a secretive system; misinformation/misunderstanding; mistrust in science/government. ‘Transparency’ could be the deficit model reinvented or maybe open up potential for new science-society relations. She offered a framework that might be of interest for future research on transparency in other domains. Sarah Hartley’s projects on the governance of agricultural biotechnology at international and national levels showed promise for unsettling the status quo of public engagement as legitimisation of pre-established priorities, by enabling actors such as the UK Biotechnology and Biological Sciences Research Council (BBSRC) to consider the full range of public and disciplinary expertise available to them at different stages of their work. Carol Morris and Susanne Seymour found that the UK food security research field is in theory open to contributions from social science and humanities (SSH), but narrowly conceived (economics, psychology, ‘people’ rather than subjectivities). However, SSH has the potential to re-frame such research (e.g. from security to sovereignty, and from production to waste). More attention should be paid to interdisciplinary politics. Guided by questions from discussant Fern Wickson (GenØk – Centre for Biosafety), the subsequent discussion considered the role of RRI and engagement as tools for re-politicisation; the university as a post-political, privatised space; the need to focus on the quality of deliberations in such initiatives, and consider what publics might gain from participation; and on whose terms social scientists should and can engage with policy. Is the common trope of a clash between science, democracy and religion adequate? What roles do science and religion play in moderating democratic conflicts? In Alexander Smith’s study of the Kansas ‘culture wars’ around evolution/creation in state school curricula, science has become a battleground, but this is best characterised as a debate between political activists over religion and science rather than one between religion and secularism. A normative theory of political moderation is required, entailing a commitment to pluralist political community and civility towards people with whom one disagrees. Warren Pearce saw moderation as disciplined engagement with divided publics, a key responsibility of all academics (both natural and social scientists) in their engagements with policy makers and publics, and particularly necessary in highly polarised cases such as climate change. Brigitte Nerlich’s analysis of the relationship between concepts of (un)certainty, consensus and religious rhetoric in climate discourse suggested that as insistence on the certainty of the science increased, religious metaphors (e.g. ‘cult’, ‘dogma’, ‘preaching’, ‘prophecies’) were used to challenge mainstream science. While decision-making in the presence of uncertainty is a familiar topic, certainty and polarisation are perhaps new problems. Vivien Lowndes reminded us of the political nature of evidence, distinguishing between data (observations about the world), information (data that has been organised/categorised) and evidence (information that has been selected in support of an argument). In the case of Pakistani Christian asylum seekers in the UK, officials assessing asylum claims and the asylum seekers themselves had different views on what constituted evidence of religious identity and religious persecution, based on different understandings of Christianity. Evidence-gathering and use involves active processes of translation, power and selection; also on the part of social scientists. Discussion, led by observations from Robert Antonio (University of Kansas), focused on the dearth of deep normative visions in contemporary politics, and the significance of constitutional arrangements and institutional designs for agonism, respectful disagreement and dialogue. How are publics – and progress – imagined in participatory initiatives and more broadly? 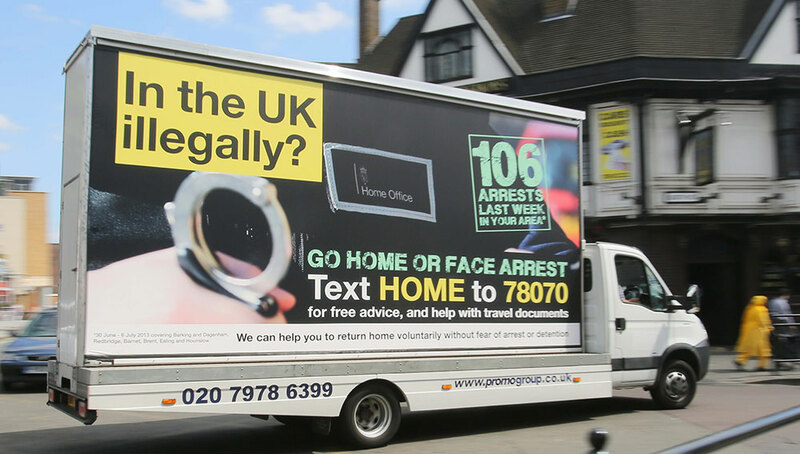 Roda Madziva introduced the case of the ‘Go Home’ vans (Figure 1), a 2013 UK government initiative to ‘encourage’ illegal immigrants to leave the country. Here ‘immigrants’ became a category of people excluded from ‘the public’, visible only as the target of increasingly restrictive policies which claimed to reflect public opinion. However, British publics rejected the vans’ meanings by crafting alternatives (Figure 2), and the ‘Go Home’ vans were eventually withdrawn. Informed by her ethnographic fieldwork on activists’ understandings of responsible innovation, Stevienna de Saille suggested that those wanting to engage need not only an idea of how science works but also knowledge of (macro)economics, given that definitions of R(R)I predominantly rely on the market-based meaning of innovation, as opposed to ‘ingenuity’. This prompted an exploration of responsible stagnation and what innovation might look like in a steady state economy. In my case study of Future Earth (a major international research initiative on global environmental change and sustainability), co-design and co-production of research were envisioned in diverse ways underpinned by different conceptualisations of the public value of research and the proper relationship between science, politics and their stakeholders. This gave rise to tensions and ambiguities, which are not necessarily problematic if Future Earth is seen as an ongoing experiment; ambiguity makes space for openness and flexibility. Alison Mohr’s talk made a case for bringing distributive and procedural justice principles to bear on global North-centric sustainability transition frameworks. Co-design of solar nano-grid technologies in rural Kenya and Bangladesh promoted opportunities for communities (women and youth, in particular) to write the script of their own socio-technical transitions and move beyond narrow, top-down energy framing to consider broader socio-economic needs. Subsequent discussion, initiated by Alan Irwin’s (Copenhagen Business School) insightful questions, considered the role of social movements as sites of experimentation, whether ‘co-’ talk diverts from more deeply embedded power dynamics, and what responsibility we as social scientists (should) have for how ‘our’ concepts are framed and used in practice. How is the public interest imagined and framed, and how might these visions be reconstructed for our times? Sujatha Raman suggested that having acknowledged the plurality of publics, new ways of thinking about the public interest might be opened up by seeing social questions as inherently material. For example, a challenge like antibiotic resistance might be understood as needing inequality and poverty to be addressed in order for pharmaceutical technologies to work. Adam Spencer found that UK policymakers envisage a major role for science and technology in food production: in meeting both the increased global need for food and the UK’s national trade interests within the neoliberal global system. A nascent UK food sovereignty movement, originating in developing countries, instead emphasises local governance. Paul Martin considered the role of civil society organisations in articulating an alternative vision of science/technology in the public interest, noting that their knowledge is often seen as illegitimate, despite using the methods of science. So what is their role: are they outsiders, or part of the public? Do they provide a form of accountability in acting in the name of the public interest? John Holmwood addressed the closing down of open spaces, arguing that the UK government has misconceptualised the public interest in Higher Education as private investment in human capital, and economic growth. Researchers have been complicit in commercialisation by accepting the impact agenda, whereby publicly funded research addresses the needs of private ‘users’, including in social science big data projects. The unruly public needs to be invited back into the university. Mark Brown (California State University) highlighted the distinction between audiences of claims in the name of the public interest and constituencies supposedly represented: to what extent do those represented accept the claims, and under what conditions are they able to assess them? The discussion considered whether the term ‘public interest’ still has any power given the multiple and emergent nature of publics, and whether civil society and richer notions of ‘the state’ might be adequate replacements. What Kinds of Evidence Do We Need in a Democracy? On the public panel, Charlotte Watts (Chief Scientific Adviser, UK Department for International Development) noted policymakers’ need for multidisciplinary syntheses of complex problems, but also the challenges of difference in pace between research and policymaking, and scalability of research results. James Wilsdon (University of Sheffield) suggested that while notions of experts and evidence received a battering in the context of the referendum, recent developments in the impact agenda and scientific advice show promise for the science-policy interface. However, steps should be taken to develop the support structures around ‘brokers’, broaden the disciplinary spread drawn on in policymaking, and take public knowledge seriously in these contexts. Brian Wynne (Lancaster University) argued that to move beyond decisionism we need to focus on whether we are collectively asking the right questions: too many questions are posed with one particular policy purpose in mind. Which questions aren’t on the table? Sheila Jasanoff (Harvard University) proposed a further consideration: what sort of polity or democracy should we build to ask the right questions? The word ‘evidence’ has become colonised and now people are rebelling against this. However, denying the power of science is not the way to decolonise it; rather we need to think about the accountability of counters, modellers and the ways in which their (ac)counts affect people (not an aggregate public). The subsequent discussion explored which capacities are needed at the science-policy interface, and the importance of understanding how and why some capacities (particularly of public reason) are not currently being built. This point is all the more poignant in post-referendum hindsight. While questions of citizenship and community are, for many of us in the UK, currently imbued with profound sadness, we are buoyed by the support and friendship of our colleagues across Europe and beyond. We hope for the continuation of inspiring, interdisciplinary, international collaborations well into the future; not least to strengthen conditions and capacities for political accountability and public reason(ing) so that we might move forward holding together differences without falling apart. Eleanor Hadley Kershaw is a doctoral researcher at the Institute for Science and Society, University of Nottingham. 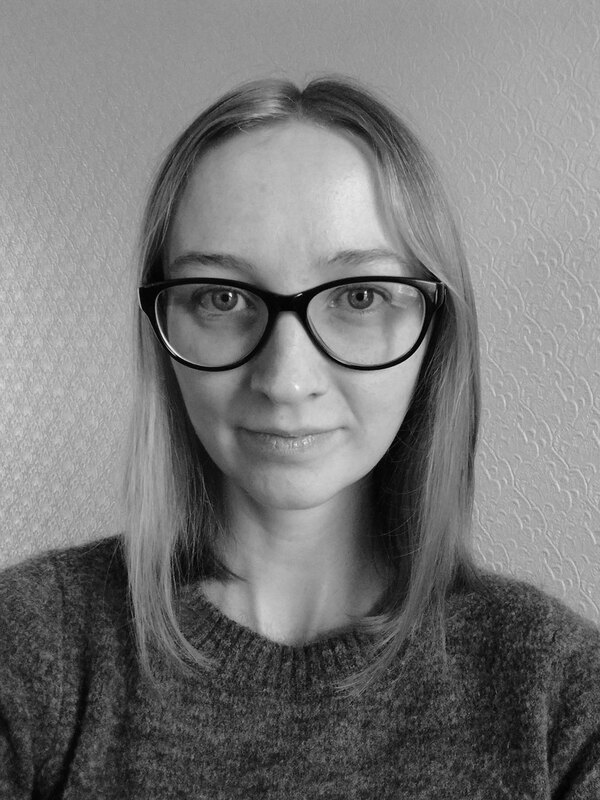 Her PhD is part of the Making Science Public programme and explores co-production and transdisciplinarity in global environmental change research, using Future Earth (futureearth.org) as a case study. Her background is in English literature, theatre/performance, environment, sustainability and international science policy. Prior to starting her PhD she was Global Environmental Change Project Manager at the International Social Science Council (ISSC).